The best thing about being queen of Wonderland is that any wonderful thing can happen. How about allowing your child to rule for a day? It’ll be fine! Trust us. Just, you know, try to get her to be a bit nicer than her predecessor in this Child Deluxe Queen of Hearts Costume. She won’t even be able to imagine it--a whole day where she’s the queen! She can play croquet with flamingoes and hedgehogs, have a royal set of cards as her guards, and even drink tea with the Mad Hatter. 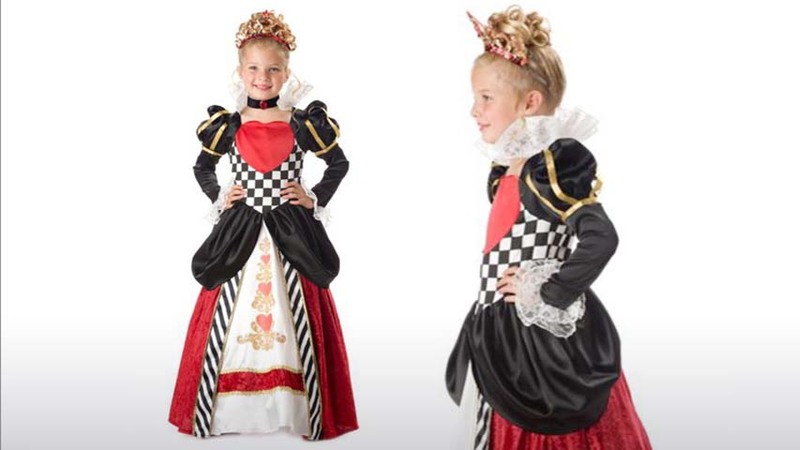 Your little miss is bound to feel downright stately (and hopefully act the part) in this ensemble that is truly fit for royalty. Maybe she’ll turn out to be a magnanimous ruler, a generous queen--bestowing pizza and ice cream upon all her family. Or she could slip on this outfit and become a brilliant ruler, a productive queen--doing all of her homework the first time you ask! The possibilities are endless once she’s dressed to play the part. And dressed she is! 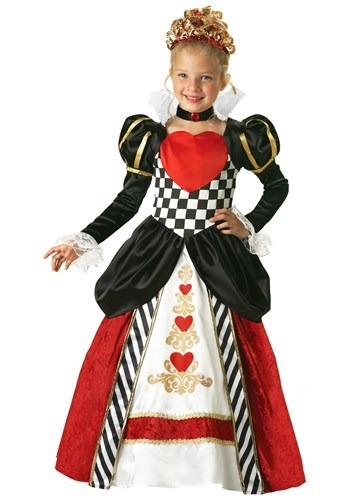 This look features a checkered bodice with a ruby-red heart on the chest, alongside black puffy sleeves with lace cuffs and gold trim. The ensemble is made even more luxe by the stiffened lace collar and black velvet choker. There is also a rich velvet skirt and even a bejeweled tiara, lest anyone forget just who is in charge around Wonderland! Extremely disappointed in this product. Very expensive but I was looking for something of good quality so I decided to buy it. It’s not worth the money! Very poorly made, looks cheap and nothing like the photo. The undergarment is so badly finished it’s as good as a piece of cloth. I’ve purchased other items too such as The children’s Alicia costume, equally disappointed..